There it is, hidden in plain sight- all of this season’s big sellers! Where is this magical place? 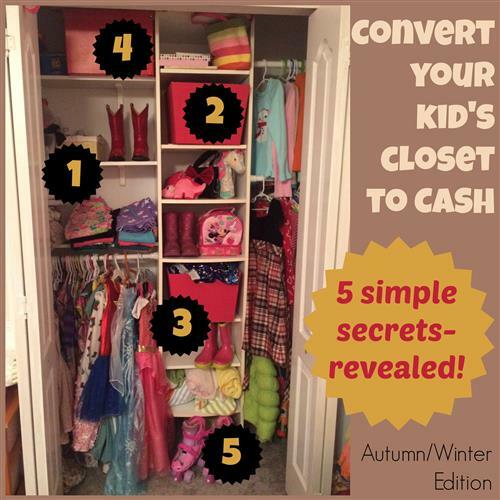 You might be surprised to find that it is all right there- in your child’s closet. Whether your little one is 2,4,6 or 8- get ready for a seasonal sale we can all appreciate! So what are these 5 simple secrets? 1. Have your child try on the pants they have in their closet- now! But it is 98 degrees outside and 100% humidity. I get that. I also get that in just a few days, the frenzy of tax free back to school shopping will commence. Parents will be bombarded with sales ads, coupons and deals from retailers. Why try on pants now? So you know what to sell and what to keep. TIP: take out a pair of pants that fit them the best and carry it with you to the consignment sales! Bringing a tape measure is a good tip as well, it’s just I would rather not have to deal with numbers if I don’t have to. Once the pants are separated into KEEP and SELL piles, we can move on to more seasonal items. 2. Holiday Attire- the more the merrier! How many Christmas sweaters can you own?! That’s not what I mean by ‘more the merrier’. I am talking about pairing the beautiful red and black velvet and plaid dress with a matching back handbag. Digging through the kids’ dresser and finding the pair of leggings that went with the blue Gymboree snowman sweater. Pull out all the holiday clothing and decide what still fits and what can be sold. This is the sale to do it! 4. Dust off those boots! I have been blessed to live in the Sunshine state all my life, so it wasn’t until my late teens when I started meeting people from the northern states that I truly understood why people would where these big clunky things on their feet. Fast forward a decade or so, and my daughter (and her mother) are huge fans of this style of footwear. Unfortunately, we here in Florida do not get to wear them as often as we would like. That means they stay in relatively good shape and are a perfect item to buy and sell at consignment sales. From the tall red cowboy boots to the sequined fur-lined booties, give them a good polish (or spin in the washing machine and air dry) and put them aside for the upcoming sale. 5. Buying jackets and coats at retail prices are not for you. You are the one who sells your slightly used jackets every year, only to purchase different ones at the same sale, just a few sizes larger. Like I said before, we are in Florida- were a snowstorm is about as likely as no traffic on I-95 at 6pm. We just don’t use them like our neighbors to the north. But we do need them, for those few weeks in January & February when we actually have to turn the heat on in the house. Make sure you take care of them throughout the year so they will be in good condition come sale time. Remember, the sooner you start digging through your little’s closets, the less likely you are to buy something you already have, or (God forbid) buy something for full price! Wait for WeeTRADE!